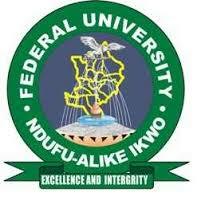 Federal University Ndufu-Alike, Ikwo (FUNAI) Postgraduate Studies Admission Form (Full-Time, Part-Time and Weekend Programmes), Programmmes, Duration, Admission Requirements, Application Guidelines for 2018/2019 Academic Session. The Referee report forms after being filled-in by the Referees should be received back in sealed envelopes (addressed to The Secretary, School of Postgraduate Studies, Alex Ekwueme Federal University, Ndufu Alike, Ebonyi State) by the candidates and enclosed alongside other documents in the application package. Kindly note that applications are not complete and would not be processed unless the Referee reports are available. The Secretary, School of Postgraduate Studies, Alex Ekwueme Federal University, Ndufu Alike, PMB 1010, Abakaliki, Ebonyi State.